"Of course, in one sense, the first essential for a man's being a good citizen is his possession of the home virtues of which we think when we call a man by the emphatic adjective of manly. No man can be a good citizen who is not a good husband and a good father, who is not honest in his dealings with other men and women, faithful to his friends and fearless in the presence of his foes, who has not got a sound heart, a sound mind, and a sound body; exactly as no amount of attention to civil duties will save a nation if the domestic life is undermined, or there is lack of the rude military virtues which alone can assure a country's position in the world. In a free republic the ideal citizen must be one willing and able to take arms for the defense of the flag, exactly as the ideal citizen must be the father of many healthy children. A race must be strong and vigorous; it must be a race of good fighters and good breeders, else its wisdom will come to naught and its virtue be ineffective; and no sweetness and delicacy, no love for and appreciation of beauty in art or literature, no capacity for building up material prosperity can possibly atone for the lack of the great virile virtues. But this is aside from my subject, for what I wish to talk of is the attitude of the American citizen in civic life. It ought to be axiomatic in this country that every man must devote a reasonable share of his time to doing his duty in the Political life of the community. No man has a right to shirk his political duties under whatever plea of pleasure or business; and while such shirking may be pardoned in those of small cleans it is entirely unpardonable in those among whom it is most common - in the people whose circumstances give them freedom in the struggle for life. In so far as the community grows to think rightly, it will likewise grow to regard the young man of means who shirks his duty to the State in time of peace as being only one degree worse than the man who thus shirks it in time of war. A great many of our men in business, or of our young men who are bent on enjoying life (as they have a perfect right to do if only they do not sacrifice other things to enjoyment), rather plume themselves upon being good citizens if they even vote; yet voting is the very least of their duties, Nothing worth gaining is ever gained without effort. You can no more have freedom without striving and suffering for it than you can win success as a banker or a lawyer without labor and effort, without self-denial in youth and the display of a ready and alert intelligence in middle age. The people who say that they have not time to attend to politics are simply saying that they are unfit to live in a free community. Their place is under a despotism; or if they are content to do nothing but vote, you can take despotism tempered by an occasional plebiscite, like that of the second Napoleon. In one of Lowell's magnificent stanzas about the Civil War he speaks of the fact which his countrymen were then learning, that freedom is not a gift that tarries long in the hands of cowards: nor yet does it tarry long in the hands of the sluggard and the idler, in the hands of the man so much absorbed in the pursuit of pleasure or in the pursuit of gain, or so much wrapped up in his own easy home life as to be unable to take his part in the rough struggle with his fellow men for political supremacy. If freedom is worth having, if the right of self-government is a valuable right, then the one and the other must be retained exactly as our forefathers acquired them, by labor, and especially by labor in organization, that is in combination with our fellows who have the same interests and the same principles. We should not accept the excuse of the business man who attributed his failure to the fact that his social duties were so pleasant and engrossing that he had no time left for work in his office; nor would we pay much heed to his further statement that he did not like business anyhow because he thought the morals of the business community by no means what they should be, and saw that the great successes were most often won by men of the Jay Gould stamp. It is just the same way with politics. It makes one feel half angry and half amused, and wholly contemptuous, to find men of high business or social standing in the community saying that they really have not got time to go to ward meetings, to organize political clubs, and to take a personal share in all the important details of practical politics; men who further urge against their going the fact that they think the condition of political morality low, and are afraid that they may be required to do what is not right if they go into politics. The first duty of an American citizen, then, is that he shall work in politics; his second duty is that he shall do that work in a practical manner; and his third is that it shall be done in accord with the highest principles of honor and justice. Of course, it is not possible to define rigidly just the way in which the work shall be made practical. Each man's individual temper and convictions must be taken into account. To a certain extent his work must be done in accordance with his individual beliefs and theories of right and wrong. To a yet greater extent it must be done in combination with others, he yielding or modifying certain of his own theories and beliefs so as to enable him to stand on a common ground with his fellows, who have likewise yielded or modified certain of their theories and beliefs. There is no need of dogmatizing about independence on the one hand or party allegiance on the other. There are occasions when it may be the highest duty of any man to act outside of parties and against the one with which he has himself been hitherto identified; and there may be many more occasions when his highest duty is to sacrifice some of his own cherished opinions for the sake of the success of the party which he on the whole believes to be right. I do not think that the average citizen, at least in one of our great cities, can very well manage to support his own party all the time on every issue, local and otherwise; at any rate if he can do so he has been more fortunately placed than I have been. On the other hand, I am fully convinced that to do the best work people must be organized; and of course an organization is really a party, whether it be a great organization covering the whole nation and numbering its millions of adherents, or an association of citizens in a particular locality, banded together to win a certain specific victory, as, for instance, that of municipal reform. Somebody has said that a racing-yacht, like a good rifle, is a bundle of incompatibilities; that you must get the utmost possible sail power without sacrificing some other quality if you really do get the utmost sail power, that, in short you have got to make more or less of a compromise on each in order to acquire the dozen things needful; but, of course, in making this compromise you must be very careful for the sake of something unimportant not to sacrifice any of the great principles of successful naval architecture. Well, it is about so with a man's political work. He has got to preserve his independence on the one hand; and on the other, unless he wishes to be a wholly ineffective crank, he has got to have some sense of party allegiance and party responsibility, and he has got to realize that in any given exigency it may be a matter of duty to sacrifice one quality, or it may be a matter of duty to sacrifice the other. One seemingly very necessary caution to utter is, that a man who goes into politics should not expect to reform everything right off, with a jump. I know many excellent young men who, when awakened to the fact that they have neglected their political duties, feel an immediate impulse to form themselves into an organization which shall forthwith purify politics everywhere, national, State, and city alike; and I know of a man who having gone round once to a primary, and having, of course, been unable to accomplish anything in a place where he knew no one and could not combine with anyone, returned saying it was quite useless for a good citizen to try to accomplish anything in such a manner. To these too hopeful or too easily discouraged people I always feel like reading Artemus Ward's article upon the people of his town who came together in a meeting to resolve that the town should support the Union and the Civil War, but were unwilling to take any part in putting down the rebellion unless they could go as brigadier-generals. After the battle of Bull Run there were a good many hundreds of thousands of young men in the North who felt it to be their duty to enter the Northern armies; but no one of them who possessed much intelligence expected to take high place at the outset, or anticipated that individual action would be of decisive importance in any given campaign. He went in as private or sergeant, lieutenant or captain, as the case might be, and did his duty in his company, in his regiment, after a while in his brigade. When Ball's Bluff and Bull Run succeeded the utter failure of the Peninsular campaign, when the terrible defeat of Fredericksburg was followed by the scarcely less disastrous day at Chancellorsville he did not announce (if he had any pluck or manliness about him) that he considered it quite useless for any self-respecting citizen to enter the Army of the Potomac, because he really was not of much weight in its councils, and did not approve of its management; he simply gritted his teeth and went doggedly on with his duty, grieving over, but not disheartened at the innumerable shortcomings and follies committed by those who helped to guide the destinies of the army, recognizing also the bravery, the patience, intelligence, and resolution with which other men in high places offset the follies and shortcomings and persevering with equal mind through triumph and defeat until finally he saw the tide of failure turn at Gettysburg and the full flood of victory come with Appomattox. I do wish that more of our good citizens would go into politics, and would do it in the same spirit with which their fathers went into the Federal armies. Begin with the little thing, and do not expect to accomplish anything without an effort. Of course, if you go to a primary just once, never having taken the trouble to know any of the other people who go there you will find yourself wholly out of place; but if you keep on attending and try to form associations with other men whom you meet at the political gatherings, or whom you can persuade to attend them, you will very soon find yourself a weight. In the same way, if a man feels that the politics of his city, for instance, are very corrupt and wants to reform them, it would be an excellent idea for him to begin with his district. If he joins with other people, who think as he does, to form a club where abstract political virtue will be discussed he may do a great deal of good. We need such clubs; but he must also get to know his own ward or his own district, put himself in communication with the decent people in that district, of whom we may rest assured there will be many, willing and able to do something practical for the procurance of better government. Let him set to work to procure a better assemblyman or better alderman before he tries his hand at making a mayor, a governor, or a president. If he begins at the top he may make a brilliant temporary success, but the chances are a thousand to one that he will only be defeated eventually; and in no event will the good he does stand on the same broad and permanent foundation as if he had begun at the bottom. Of course, one or two of his efforts may be failures; but if he has the right stuff in him he will go ahead and do his duty irrespective of whether he meets with success or defeat. It is perfectly right to consider the question of failure while shaping one's efforts to succeed in the struggle for the right; but there should be no consideration of it whatsoever when the question is as to whether one should or should not make a struggle for the right. When once a band of one hundred and fifty or two hundred honest, intelligent men, who mean business and know their business, is found in any district, whether in one of the regular organizations or outside, you can guarantee that the local politicians of that district will begin to treat it with a combination of fear, hatred, and respect, and that its influence will be felt; and that while sometimes men will be elected to office in direct defiance of its wishes, more often the successful candidates will feel that they have to pay some regard to its demands for public decency and honesty. But in advising you to be practical and to work hard, I must not for one moment be understood as advising you to abandon one iota of your self-respect and devotion to principle. It is a bad sign for the country to see one class of our citizens sneer at practical politicians, and another at Sunday-school politics. No man can do both effective and decent work in public life unless he is a practical politician on the one hand, and a sturdy believer in Sunday-school politics on the other. He must always strive manfully for the best, and yet, like Abraham Lincoln, must often resign himself to accept the best possible. Of course when a man verges on to the higher ground of statesmanship, when he becomes a leader, he must very often consult with others and defer to their opinion, and must be continually settling in his mind how far he can go in just deference to the wishes and prejudices of others while yet adhering to his own moral standards: but I speak not so much of men of this stamp as I do of the ordinary citizen, who wants to do his duty as a member of the commonwealth in its civic life; and for this man I feel that the one quality which he ought always to hold most essential is that of disinterestedness. If he once begins to feel that he wants office himself, with a willingness to get it at the cost of his convictions, or to keep it when gotten, at the cost of his convictions, his usefulness is gone. Let him make up his mind to do his duty in politics without regard to holding office at all, and let him know that often the men in this country who have done the best work for our public life have not been the men in office. If, on the other hand, he attains public position, let him not strive to plan out for himself a career. I do not think that any man should let himself regard his political career as a means of livelihood, or as his sole occupation in life; for if he does he immediately becomes most seriously handicapped. The moment that he begins to think how such and such an act will affect the voters in his district, or will affect some great political leader who will have an influence over his destiny, he is hampered and his hands are bound. Not only may it be his duty often to disregard the wishes of politicians, but it may be his clear duty at times to disregard the wishes of the people. The voice of the people is not always the voice of God; and when it happens to be the voice of the devil, then it is a man's clear duty to defy its behests. Different political conditions breed different dangers. The demagogue is as unlovely a creature as the courtier, though one is fostered under republican and the other under monarchical institutions. There is every reason why a man should have an honorable ambition to enter public life, and an honorable ambition to stay there when he is in; but he ought to make up his mind that he cares for it only as long as he can stay in it on his own terms, without sacrifice of his own principles; and if he does thus make up his mind he can really accomplish twice as much for the nation, and can reflect a hundredfold greater honor upon himself, in a short term of service, than can the man who grows gray in the public employment at the cost of sacrificing what he believes to be true and honest. And moreover, when a public servant has definitely made up his mind that he will pay no heed to his own future, but will do what he honestly deems best for the community, without regard to how his actions may affect his prospects, not only does he become infinitely more useful as a public servant, but he has a far better time. He is freed from the harassing care which is inevitably the portion of him who is trying to shape his sails to catch every gust of the wind of political favor. But let me reiterate, that in being virtuous he must not become ineffective, and that he must not excuse himself for shirking his duties by any false plea that he cannot do his duties and retain his self-respect. This is nonsense, he can; and when he urges such a plea it is a mark of mere laziness and self-indulgence. And again, he should beware how he becomes a critic of the actions of others, rather than a doer of deeds himself; and in so far as he does act as a critic (and of course the critic has a great and necessary function) he must beware of indiscriminate censure even more than of indiscriminate praise. The screaming vulgarity of the foolish spread-eagle orator who is continually yelling defiance at Europe, praising everything American, good and bad, and resenting the introduction of any reform because it has previously been tried successfully abroad, is offensive and contemptible to the last degree; but after all it is scarcely as harmful as the peevish, fretful, sneering, and continual faultfinding of the refined, well-educated man, who is always attacking good and bad alike, who genuinely distrusts America, and in the true spirit of servile colonialism considers us inferior to the people across the water. It may be taken for granted that the man who is always sneering at our public life and our public men is a thoroughly bad citizen, and that what little influence he wields in the community is wielded for evil. The public speaker or the editorial writer who teaches men of education that their proper attitude toward American politics should be one of dislike or indifference is doing all he can to perpetuate and aggravate the very evils of which he is ostensibly complaining. Exactly as it is generally the case that when a man bewails the decadence of our civilization he is himself physically, mentally, and morally a first-class type of the decadent, so it is usually the case that when a man is perpetually sneering at American politicians, whether worthy or unworthy, he himself is a poor citizen and a friend of the very forces of evil against which he professes to contend. Too often these men seem to care less for attacking bad men, than for ruining the characters of good men with whom they disagree on some pubic question; and while their influence against the bad is almost nil, they are sometimes able to weaken the hands of the good by withdrawing from them support to which they are entitled, and they thus count in the sum total of forces that work for evil. They answer to the political prohibitionist, who, in a close contest between a temperance man and a liquor seller diverts enough votes from the former to elect the liquor seller Occasionally it is necessary to beat a pretty good man, who is not quite good enough, even at the cost of electing a bad one - but it should be thoroughly recognized that this can be necessary only occasionally and indeed, I may say, only in very exceptional cases, and that as a rule where it is done the effect is thoroughly unwholesome in every way, and those taking part in it deserve the severest censure from all honest men. Moreover, the very need of denouncing evil makes it all the more wicked to weaken the effect of such denunciations by denouncing also the good. It is the duty of all citizens, irrespective of party, to denounce, and, so far as may be, to punish crimes against the public on the part of politicians or officials. But exactly as the public man who commits a crime against the public is one of the worst of criminals, so, close on his heels in the race for iniquitous distinction, comes the man who falsely charges the public servant with outrageous wrongdoing; whether it is done with foul-mouthed and foolish directness in the vulgar and violent party organ, or with sarcasm, innuendo, and the half-truths that are worse than lies, in some professed organ of independence. Not only should criticism be honest, but it should be intelligent, in order to be effective. I recently read in a religious paper an article railing at the corruption of our public life, in which it stated incidentally that the lobby was recognized as all-powerful in Washington. This is untrue. There was a day when the lobby was very important at Washington, but its influence in Congress is now very small indeed; and from a pretty intimate acquaintance with several Congresses I am entirely satisfied that there is among the members a very small proportion indeed who are corruptible, in the sense that they will let their action be influenced by money or its equivalent. Congressmen are very often demagogues; they are very often blind partisans; they are often exceedingly short-sighted, narrow-minded, and bigoted; but they are not usually corrupt; and to accuse a narrow-minded demagogue of corruption when he is perfectly honest, is merely to set him more firmly in his evil course and to help him with his constituents, who recognize that the charge is entirely unjust, and in repelling it lose sight of the man's real shortcomings. I have known more than one State legislature, more than one board of aldermen against which the charge of corruption could perfectly legitimately be brought, but it cannot be brought against Congress. Moreover these sweeping charges really do very little good. When I was in the New York legislature, one of the things that I used to mind most was the fact that at the close of every session the papers that affect morality invariably said that particular legislature was the worst legislature since the days of Tweed. The statement was not true as a rule; and, in any event, to lump all the members, good and bad, in sweeping condemnation simply hurt the good and helped the bad. Criticism should be fearless, but I again reiterate that it should be honest and should be discriminating. When it is sweeping and unintelligent, and directed against good and bad alike, or against the good and bad qualities of any man alike, it is very harmful. It tends steadily to deteriorate the character of our public men; and it tends to produce a very unwholesome spirit among young men of education, and especially among the young men in our colleges. Against nothing is fearless and specific criticism more urgently needed than against the "spoils system," which is the degradation of American politics. And nothing is more effective in thwarting the purposes of the spoilsmen than the civil service reform. To be sure, practical politicians sneer at it. One of them even went so far as to say that civil-service reform is asking a man irrelevant questions. What more irrelevant question could there be than that of the practical politician who asks the aspirant for his political favor - "Whom did you vote for in the last election?" There is certainly nothing more interesting, from a humorous point of view, than the heads of departments urging changes to be made in their underlings, "on the score of increased efficiency" they say; when as the result of such a change the old incumbent often spends six months teaching the new incumbent how to do the work almost as well as he did himself! Occasionally the civil-service reform has been abused, but not often. Certainly the reform is needed when you contemplate the spectacle of a New York City treasurer who acknowledges his annual fees to be eighty-five thousand dollars, and who pays a deputy one thousand five hundred dollars to do his work - when you note the corruptions in the New York legislature, where one man says he has a horror of the Constitution because it prevents active benevolence, and another says that you should never allow the Constitution to come between friends! All these corruptions and vices are what every good American citizen must fight against. Finally, the man who wishes to do his duty as a citizen in our country must be imbued through and through with the spirit of Americanism. I am not saying this as a matter of spread-eagle rhetoric: I am saying it quite soberly as a piece of matter-of-fact, common-sense advice, derived from my own experience of others. Of course, the question of Americanism has several sides. If a man is an educated man, he must show his Americanism by not getting misled into following out and trying to apply all the theories of the political thinkers of other countries, such as Germany and France, to our own entirely different conditions. He must not get a fad, for instance, about responsible government; and above all things he must not, merely because he is intelligent, or a college professor well read in political literature, try to discuss our institutions when he has had no practical knowledge of how they are worked. Again, if he is a wealthy man, a man of means and standing, he must really feel, not merely affect to feel, that no social differences obtain save such as a man can in some way himself make by his own actions. People sometimes ask me if there is not a prejudice against a man of wealth and education in ward politics. I do not think that there is, unless the man in turn shows that he regards the facts of his having wealth and education as giving him a claim to superiority aside from the merit he is able to prove himself to have in actual service. Of course, if he feels that he ought to have a little better treatment than a carpenter, a plumber, or a butcher, who happens to stand beside him, he is going to be thrown out of the race very quickly, and probably quite roughly; and if he starts in to patronize and elaborately condescend to these men he will find that they resent this attitude even more. Do not let him think about the matter at all. Let him go into the political contest with no more thought of such matters than a college boy gives to the social standing of the members of his own and rival teams in a hotly contested football match. As soon as he begins to take an interest in politics (and he will speedily not only get interested for the sake of politics, but also take a good healthy interest in playing the game itself - an interest which is perfectly normal and praise-worthy, and to which only a prig would object), he will begin to work up the organization in the way that will be most effective, and he won't care a rap about who is put to work with him, save in so far as he is a good fellow and an efficient worker. There was one time that a number of men who think as we do here tonight (one of the number being myself) got hold of one of the assembly districts of New York, and ran it in really an ideal way, better than any other assembly district has ever been run before or since by either party. We did it by hard work and good organization; by working practically, and yet by being honest and square in motive and method: especially did we do it by all turning in as straight-out Americans without any regard to distinctions of race origin. Among the many men who did a great deal in organizing our victories was the son of a Presbyterian clergyman, the nephew of a Hebrew rabbi, and two well-known Catholic gentlemen. We also had a Columbia College professor (the stroke-oar of a university crew), a noted retail butcher, and the editor of a local German paper, various brokers, bankers, lawyers, bricklayers and a stonemason who was particularly useful to us, although on questions of theoretic rather than applied politics he had a decidedly socialistic turn of mind. Again, questions of race origin, like questions of creed, must not be considered: we wish to do good work, and we are all Americans, pure and simple. In the New York legislature, when it fell to my lot to choose a committee - which I always esteemed my most important duty at Albany - no less than three out of the four men I chose were of Irish birth or parentage; and three abler and more fearless and disinterested men never sat in a legislative body; while among my especial political and personal friends in that body was a gentleman from the southern tier of counties, who was, I incidentally found out, a German by birth, but who was just as straight United States as if his ancestors had come over here in the Mayflower or in Henry Hudson's yacht. Of course, none of these men of Irish or German birth would have been worth their salt had they continued to act after coming here as Irishmen or Germans, or as anything but plain straight-out Americans. We have not any room here for a divided allegiance. A man has got to be an American and nothing else; and he has no business to be mixing us up with questions of foreign politics, British or Irish, German or French, and no business to try to perpetuate their language and customs in the land of complete religious toleration and equality. If, however, he does become honestly and in good faith an American, then he is entitled to stand precisely as all other Americans stand, and it is the height of un-Americanism to discriminate against him in any way because of creed or birthplace. No spirit can be more thoroughly alien to American institutions, than the spirit of the Know-Nothings. In facing the future and in striving, each according to the measure of his individual capacity, to work out the salvation of our land, we should be neither timid pessimists nor foolish optimists. We should recognize the dangers that exist and that threaten us: we should neither overestimate them nor shrink from them, but steadily fronting them should set to work to overcome and beat them down. Grave perils are yet to be encountered in the stormy course of the Republic - perils from political corruption, perils from individual laziness, indolence and timidity, perils springing from the greed of the unscrupulous rich, and from the anarchic violence of the thriftless and turbulent poor. 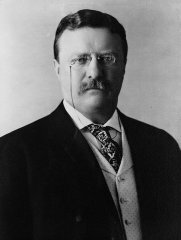 There is every reason why we should recognize them, but there is no reason why we should fear them or doubt our capacity to overcome them, if only each will, according to the measure of his ability, do his full duty, and endeavor so to live as to deserve the high praise of being called a good American citizen."